Taking a short summer break. In the meantime, enjoy the rest of your own summer days (and nights). Be back soon. The 10 winners of the eighth annual Best New Wine Lists award offer outstanding wines from far and wide, even from the tiniest and most remote vineyards (including India, Turkey -- and Ohio). 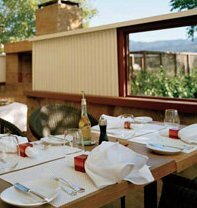 The lists, all from restaurants that have opened within the past year or so, generally assume that customers are willing to spend a bit more on wines than they have in the past. Still, each features at least some sensational bargains, as well as a wide range of good food matches. The winners are here in this month's Food & Wine Magazine . Interesting stuff. In any event, here's hoping your weekend is also a winner, so cheers and have a great one. Or, at least she will be, and with the blessing of the Daytime Queen Of Chat herself, Oprah Winfrey. Announced earlier this year at New York's Night Of A Thousand Dinners benefit, it seems Rachael Ray has stirred up a deal with Oprah for her very own hour-long talk show produced by Oprah's Harpo Productions which is set to debut in the fall. The syndicated show, which will aim to be intimate and fun -- and not celebrity-driven -- is not just aimed towards foodies and wannabe gourmet chefs, but for anyone looking to improve their lives -- whether it be how to organize your office or trying something new outside of the kitchen. And of course, all I can say is: Damn good going, Rach! With several Food Network TV spots (30-Minute Meals still an overall favorite), multiple cookbooks, the launch of your Everyday Magazine , being voted one of Time Magazine's 100 Most Influential People for 2006, and now your very own talk show...where does it end?? The short answer is hopefully -- it won't. So let me just exclaim E.V.O.O., YUM-O, and all your other catch-phrases that constantly have your critics rolling their eyes (through an apparent lack of what else to do with themselves, no doubt) -- but keep you happily carting it all off to the bank, girlfriend. Looking forward to catching you this fall. Congrats to celebrity super chef Bobby Flay on the opening of his fifth restaurant called Bobby Flay Steak, at the Borgata Hotel Casino and Spa in Atlantic City, N.J.
Thankfully, New Jersey Governor Jon Corzine, et al, have finally come to an agreement after last week's massive flap and subsequent shutdown of the state's government facilities including public beaches, resorts, etc.. All appears to be well now (except of course, New Jerseyites having to dig a little deeper as a result of a hike in sales tax) and the casinos are back in full swing -- allowing visitors to work up a healthy appetite at either the slots or the gambling tables. And no doubt, if this new steak house is anything like Chef Flay's other successful eateries, it'll be worth a visit on your next Atlantic City excursion. Read more about the grand opening here. Also, what could be better for a South Jersey / Philly style steak than Flay's recipe for Provolone Sauce? 1. Melt butter in a medium saucepan over medium heat. Whisk in the flour and cook for 1 minute. 2. Slowly whisk in the warm milk, and cook, whisking constantly until thickened, about 3 to 4 minutes. 3. Remove the mixture from the heat and whisk in the provolone and parmesan until combined; season with salt and white pepper. Good eats and good Monday, gang! Peace. Just image your private helicopter landing on the roof of a Manhattan skyscraper, with your favorite drink already shaken-- not stirred -- and waiting for you as soon as you plant your feet on...well, whatever the roof floor might be made of in these cases. Helicopter landing facilities aside, a feature article in this month's New York Magazine puts the spotlight on several rooftop watering holes here in NYC that are making quite a name for themselves these days. And no doubt, one of my favorites to check out on the list is: Bookmarks Library Hotel (pictured above) at 299 Madison Ave., at 41st St. The Hours: Mon. to Sat., 4 p.m. to midnight; Sun., closed. This Grand Central-area hotel is also where each guestroom floor is named after one of the ten major Dewey Decimal System categories. Now, how bookishly cool is that?? So if you're going to be in or around the NYC area, I'd say it's well worth checking into, so cheers and bottoms up! In the meantime, the weekend's here again, so as always -- have yourselves a great one. And is it any wonder that celebrity chef Bobby Flay is one of Food Network's (as well as America's) foremost grill masters? 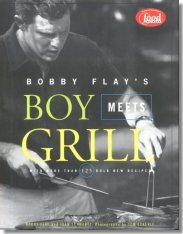 No doubt, for me, Bobby Flay's Boy Meets Grill : With More Than 125 Bold New Recipes is the best by far for all your 4th of July barbeque techniques and recipes. So in keeping with the famous phrase he also coined on several of his Food Network showcases, good "grillin' and chillin'" today and tomorrow as America continues to enjoy this super-long holiday weekend, gang. Peace.